This is a photo from 1975 showing Trudy with the teachers and students at Alpha Alternative School, Toronto, posing on a Geodesic Dome that the students built . 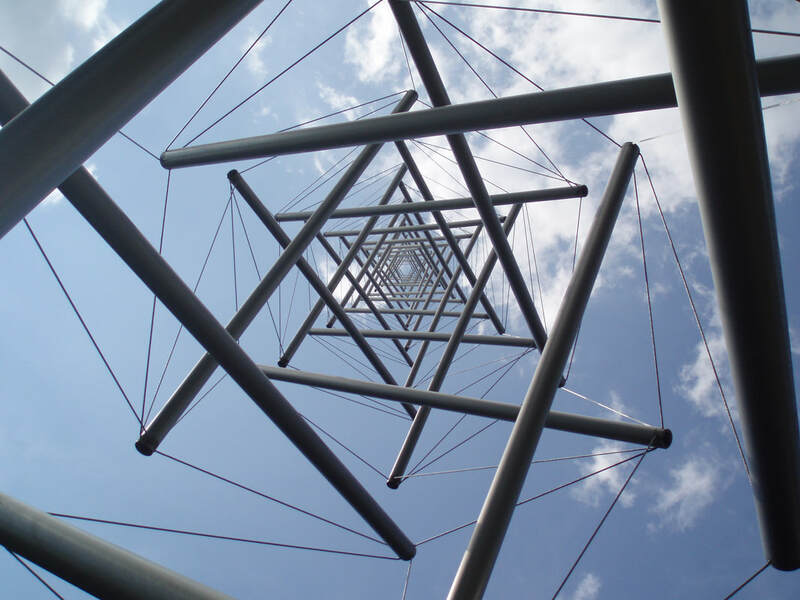 A hands on teaching project to foster understanding of the Tensegrity principle. Biotensegrity lecture at UBC with Stephen Levin as keynote and 2 other speakers. 70 people attending. BIG - Biotensegrity Interest Group Retreat with Stephen Levin and 15 invited guests. Presentations, discussions, practices. Meditation workshops with Will Johnson. I want to say thank you so much for that rejuvenating workshop. I felt the fluids move more freely through my back body after the class...what a feeling. I have never felt the blood move around my back like that ...even during regular asana! What a difference slowing down our movement makes, not only the body, but the mind as well. I have been practicing Yoga with Trudy Austin since 2010, when I was recovering from neck cancer and throat radiation. I had been quite weakened by surgery and my subsequent treatments and also suffered from stiffness and numbness of the neck and upper shoulder area. I found Trudy's approach to considering my overall physical condition and well being very restorative and sensitive. She matched the practice both to my abilities and my challenges and my state of mind, which was much improved through mindful breathing and chakra work. When I think back over the past eight years, I am amazed by how much territory we covered together and with other teachers, introduced through semiannual weekend retreats. Trudy also organized some smaller residential retreats which lead us to move deeper into our understanding of both the Tensegrity series and the Viijnana yoga tradition. It started with an ad at a racquets club~ “yoga for squash players”. The interest was to sooth aging aching muscles and to perhaps improve flexibility. Of course there were the expected standard asanas, soon complimented by the tensegrity method- a series designed by one of Trudy’s phenomenal teachers to improve the strength, symmetry and effectiveness of the muscular - skeletal structure. From whence, with our yoga practice, we learnt about and recognized the fascia layers of the body and also about the corporal rather than the local connectivity of muscle tissue and tendons( anatomy trains). And the wonderful sessions progressed on to learning pranayama( breathing) and dhyana (meditation). We were soon reading, studying and discussing the yoga sutras for beginners, which then led to studying Patanjali’s original treatise on yoga and more recently what many consider to be the ultimate text on yoga and life - the bhagavad gita. ​Through Trudy, we were introduced to exceptional scholars, committed practitioners, fellow explorers and enlightened individuals who are all serving to expand and deepen our knowledge of, dare I say, “life”. Namaste- and an infinite thank you, our dear friend, guide and inspiration. And my opponents say that my squash playing has never been better.